free delivery to all EU countries and Switzerland! professional advice: Tel. +41 71 672 45 07 or e-mail. The product have successed add to cart ! The Sole cleaning machine wall is a compact and efficient machine for cleaning shoe soles and sole edges. 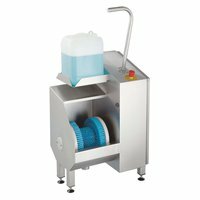 The sole cleaning machine is ideal for hygienically perfect sole cleaning in smaller production plants in the food and pharmaceutical industries, as well as in other areas with strict hygiene regulations. For the cleaning of the soles of boots, work shoes and clogs, the sole cleaning device is equipped with a specially shaped brush with high-quality nylon bristles. The design of the round brush allows simultaneous disinfection of the soles and the edges of the soles. The machine is made of high-quality stainless steel 1.4031 and is characterized by an extremely robust construction. This sole cleaning machine for the hygiene sector is suitable for soles of all common footwear in production plants and the health service. Thorough mechanical cleaning of the soles. Integrated dosing pump for cleaning agents. Minimal energy and maintenance costs. Made of finely ground, stainless steel. Image: Sole cleaning machine wall with integrated dosage pump. To start the sole cleaning machine, the employee leads his foot to the nylon brush. The sensor mounted in the housing detects the movement and starts the powerful motor. The addition of the cleaning agent is carried out by an adjustable dosing pump, which is also triggered by the sensor. The employee can then rub his shoe into the nylon bristles of the rotating circular and disc brush. The arrangement of the brush allows for simultaneous cleaning of the shoe soles and the shoe sole edges. A grab rail attached to the sole cleaning device ensures a secure footing during shoe cleaning. The Sole cleaning machine wall is ready for connection, but siphon, seals and small parts are not included in the scope of delivery. © Copyright 2019 Blue Level Online-Shop All Rights Reserved.